Tree of Life Necklace . Chrysocolla . 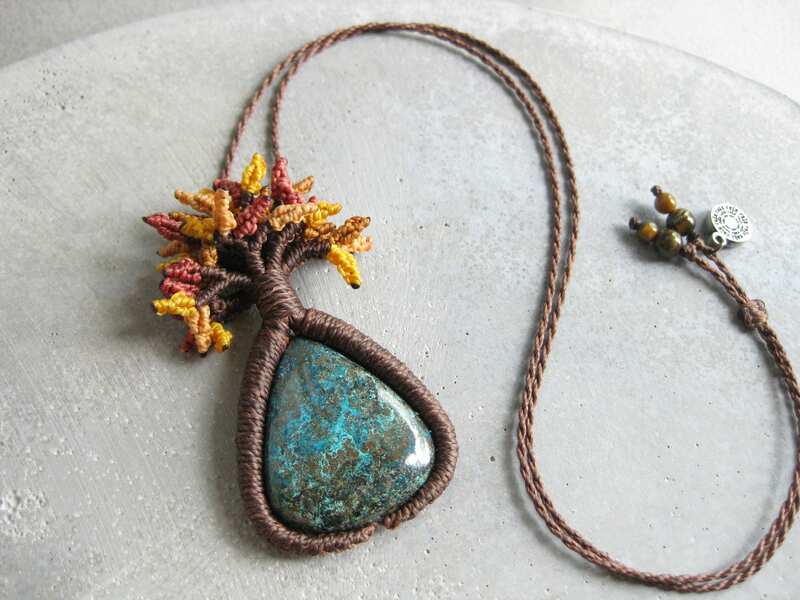 Botanical Fiber Jewelry . © Design by .. raïz .. 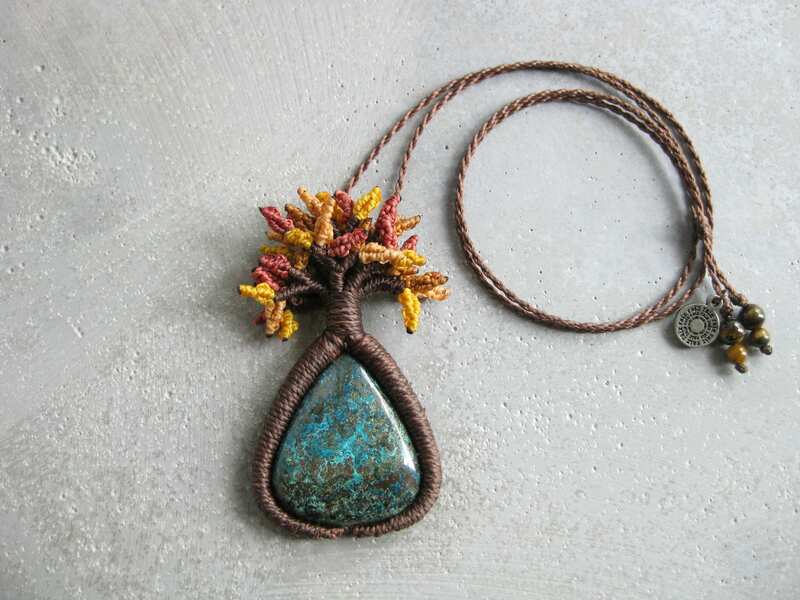 Autumn Tree of Life nurturing an beautiful Chrysocolla stone. 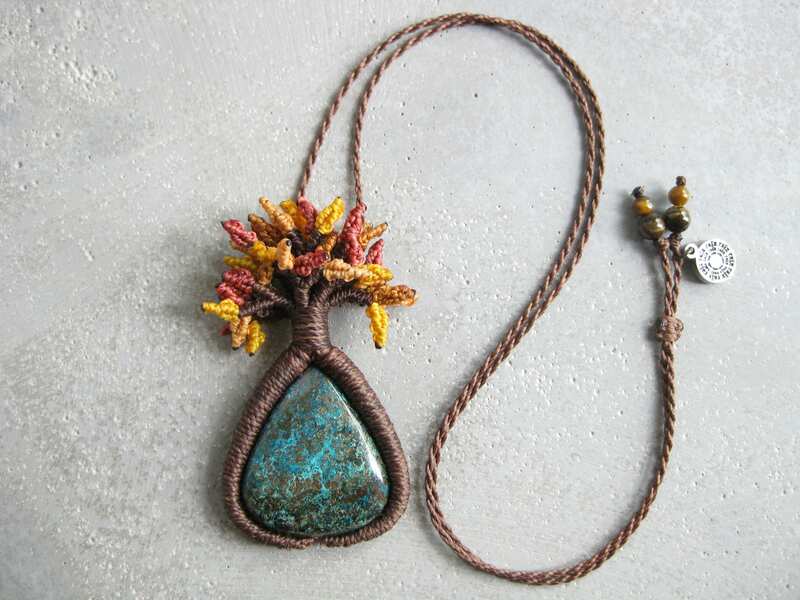 A true one-of-a-kind botanical fiber art piece made .one knot at a time. 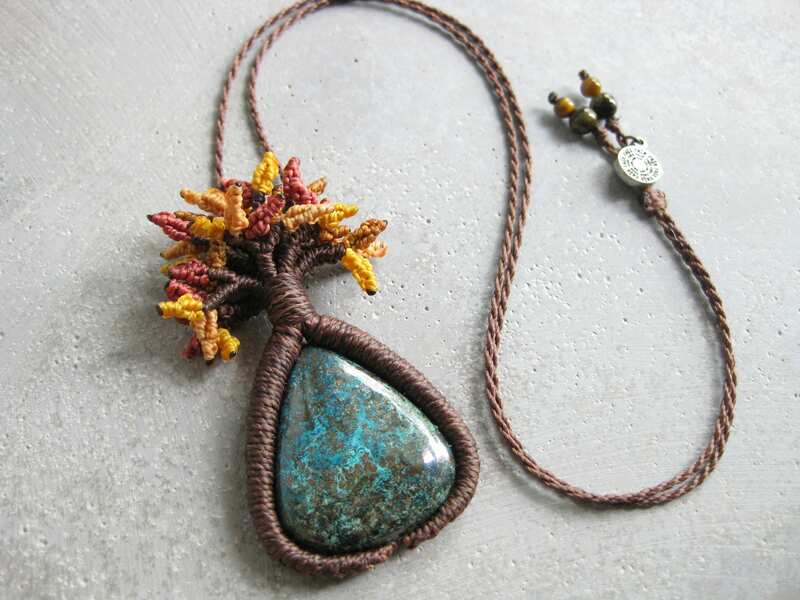 by micro macrame technique with love, soul and high quality strings: no fading, no fraying. No glue, no wire, no metal ~ this piece is perfect for sensitive skin! Copyright © Mélanie Lussier 2009-2017. All Rights Reserved. Chyrsocolla is first and foremost a Stone of Communication. Its very essence is devoted to expression, empowerment and teaching. The serenity of its turquoise-blue color discharges negative energies, calms, and allows truth and inner wisdom to surface and be heard. A peaceful stone, it emphasizes the power our words and actions have on those around us, and encourages compassion and strengthening of character. Chrysocolla is a stone of empowerment of the feminine energies, teaching that genuine power is best expressed through gentleness. It is a stone of the Goddess, and those who resonate with it will likely feel her ancient and enduring energies rising within themselves. All pieces are knotted with a high quality waxed polyester string. Such string is often used for shoemaking and upholstery, therefore the jewelry is very sturdy and durable despite its daintyness: no fraying/no fading and colours do not run if wet. ►You can even clean your jewelry if need be! Use a small brush (such as a toothbrush) with a drop of soap and water, then rinse and pat dry with a cloth. 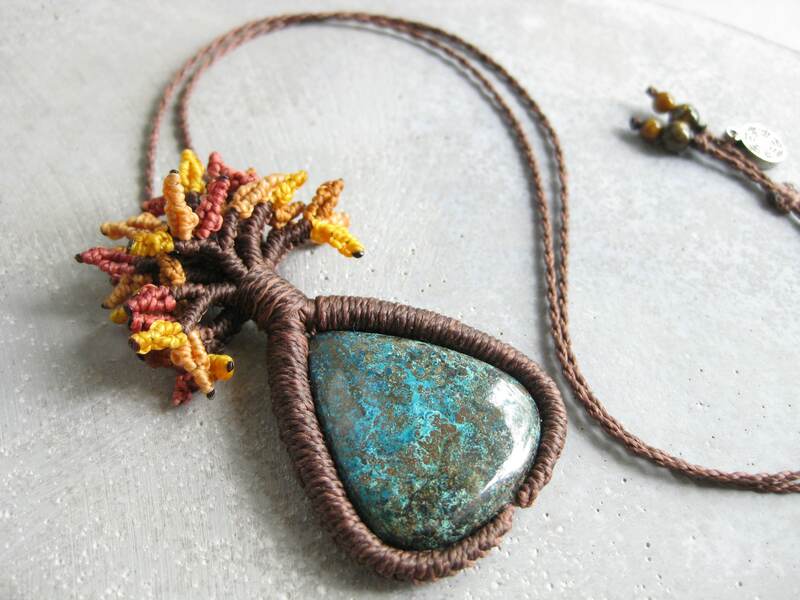 The stones set in the jewelry pieces are individually selected during my winter escapades. 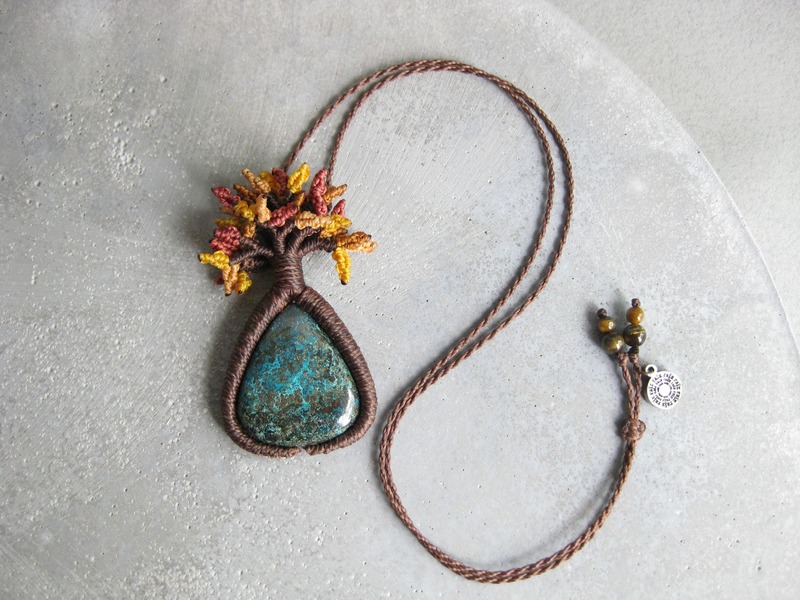 The channelling of each stone –the engraved part in which the macramé work is solidly set in by string tension- is done by an artisan friend of mine. All my photographs are taken under natural light and I try my best to make the colors appear as close as possible to the reality. Just keep in mind that there is always a slight variation through a computer screen so please get in touch with me in case of a doubt. ►Item(s) must be in brand new condition and must be returned in their original packaging within 3 days of their reception. A refund will be issued upon reception of the item. ►5$CAD handling and packing fee is non-refundable. ►Shipping fees for returning an item are the customer's responsibility. ►The original shipping cost is non-refundable except if the item received is faulty. Wholesale orders are welcome! Please contact me for more details. © 2019 .. raïz ..